What do you optimize for? Advice depends on context, assumptions, and what you’re trying to optimize for. Much of it boils down to “this is what worked for me so take it with a grain of salt and try to calibrate it for you.” Useful advice either tries to account for differences between people or include generalizable principles for how you should think about something. I think this is the wrong type of optimization. There are two things I optimize for which I’d like to explore here: interestingness and serendipity. First, “interesting.” You may have noticed that what’s interesting to you has changed over time. Why is that? Keep in mind that interests are distinct from talents. Do interests change for the same reason that mathematically-inclined minds tend to be interested in formal logic but not painting, while artistically-inclined minds tend to be interested in Broadway but not software engineering? Is what we’re generally curious about related to things that give us happy fulfilling lives? My take on this is that “interesting” is a heuristic for all of the things we need: usefulness, novelty, personal fulfillment, etc. Not only do interests change over time, we seem to jump between intense focuses and binge something until we suddenly stop caring about it. Our brains need some way to choose what to learn about. This idea has been studied in a more in-depth and rigorous way than I’ll argue here — check out this paper for instance. The point is, interests aren’t just a luxury. They serve a useful purpose that you should consciously consider when organizing your life. Second, “serendipity.” This is a major theme of Reid Hoffman’s The Startup of You and Marc Andreessen’s career guide. The thinking is that breakthrough opportunities usually present themselves through random chance. Maybe you happen to stumble across the right problem at the right time and think “hmm, why hasn’t anyone solved it this other way?” or your friends decide to go to Denny’s at 3am to discuss a business idea. Seemingly small and innocuous moments lead to truly exciting opportunities. 100k-download Android app: I spent months toying around with different programming tools and just happened to stumble upon a great tutorial and project idea I liked. I also randomly played around with a bunch of different marketing techniques for fun. Only one of many happened to stick and things just naturally snowballed from there. It was a low-quality app that I happened kill it because I had failed at plenty of other projects before it. College: originally I could only see myself at a some “elite coastal school” (staying in the Midwest, I’ve since been telling myself it’s more like “coastal-elite school.” Hah!) but luckily I decided to serendipitously apply to a bunch of schools I didn’t really care about. If I didn’t go out of my way to stir some up random luck, I wouldn’t have gotten an offer from UIUC that put me in a top CS program and saved my a quarter-million in tuition over my next-choice option. 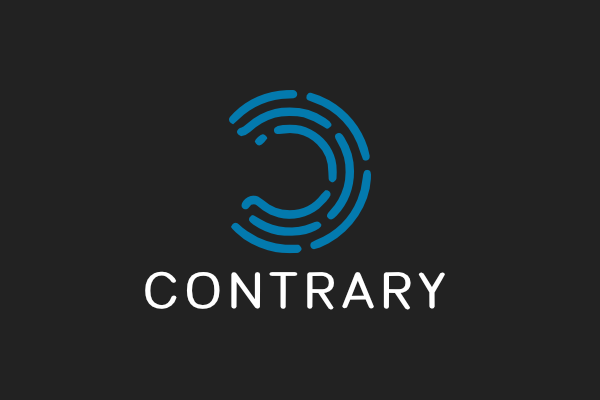 Contrary Capital: I randomly saw a Facebook post and decided to make a cold email. If I hadn’t been on my phone that night or if I hadn’t decided to spontaneously email the founder, I wouldn’t have gotten the amazing and humbling chance to help lead a venture fund. Friends: My sophomore year I went on a trip to Silicon Valley organized by my school. I wasn’t super excited and had actually turned down the chance to go the year before, but I decided I could use a little more serendipity in my life. There I made a great friend. Through her, I made some more friends. One of them became my roommate. He introduced me to many other cool people. Again, the original trip was just serendipity at work — there was no goal or process involved, but super valuable relationships grew out of it. I’m sure everyone has similar stories of pure chance turning into something incredibly meaningful. Yet most people would probably have taken the above examples and focused on some sort of process or execution that made the most of the opportunities. Think of it this way: we spend most of our lives doing things. Working towards goals. Learning. Talking. We do a great job of carrying out whatever it is that we’re trying to optimize for. We really don’t give ourselves enough credit. These two heuristics help you broaden the opportunities you come across and choose which ones matter most. That’s at least half the challenge — the rest comes naturally. The Effective Altruism movement is a philosophy and social movement that applies evidence and reason to determine the most effective ways to benefit others. In recent years, organizations like GiveWell and the Bill & Melinda Gates Foundation have helped to popularize the core concepts of Effective Altruism. They support the idea that charity should be done with a strictly analytical mindset. Under the assumption that all living creatures have some level of sentience, Effective Altruism tries to minimize the sum of all conscious suffering in the long-run. Pretty straightforward. This problem usually reduces to some basic number crunching on the ways in which people suffer and the cost necessary to mitigate that suffering. For example, it costs about $40,000 to train a seeing eye dog to help a blind person live their lives. It also costs about $100 to fund a simple surgery which would prevent somebody from going blind. It should be self evident that resources are limited and that all people’s suffering should be weighted equally. So choosing to spend limited resources on a seeing eye dog is considered immoral because it would come at the cost of ~400 people not getting eye surgery and losing their vision. This sort of utilitarian thought is fairly intuitive. To help quantify reduction of suffering across a diverse set of unique actions, health economists and bioethicists defined the Quality-Adjusted Life Year (QALY), a unit measuring longevity, discounted for disease. A perfectly healthy infant may expect to have 80 QALYs ahead of them, but if that child were born blind, they may have, say, 60 QALYs ahead of them (in this made-up example, blindness causes life to be 75% as pleasant as a perfectly healthy life). Traditional charity tends to be locally focused—you’d deliver meals for elderly people in your town or support a soup kitchen for the homeless. Considering Effective Altruism principles, however, you’d probably come to the conclusion that you can almost always save more QALYs from disease by funding health problems in impoverished African or Asian areas. In general, the more analytical you are in your giving, the more you choose to spend on this sort of giving opportunity. As philosophers become more and more rigorous in their approach to Effective Altruism, you’d expect them to continue tending towards provably high-impact spending opportunities. But many moral philosophers actually argue that we should instead focus our attention towards mitigating existential risk, dangers that could potentially end human civilization (think doomsday asteroid collisions, adversarial AI, bio-weapons, etc.). Here’s the basic argument: when trying to maximize the sum of positive sentient experiences in the long run, we need to consider what “long run” could actually mean. There are two cases. 1) humanity reaches a level of technological advancement that removes scarcity, eradicates most diseases, and allows us to colonize other planets and solar systems over the course of millions/billions of years and 2) humanity becomes extinct due to some sort of catastrophic failure or slow resource depletion. In the first case, humans would live for millions/billions of years across thousands of planets, presumably with an excellent quality of life because of the advanced technology allowing this expansion. Call this 10²³ QALYs (1bn years * 1k planets * 1bn people per planet * 100 years of life per person). Of course this scenario is unlikely—a lot of things need to go right in the next several thousand years for this to happen. But no matter how small the odds, it’s clear that the potential for positive sentient experience is unfathomably large. It’s worth noting that in the second case, the upper limit is likely on the scale of thousands of years. Philosophers argue that by that time we’ll have colonized other planets which significantly decreases the risk of any given disaster affecting the entire human race. So our second case future-QALY estimate is about 10¹⁶ (10bn human lives * 10k years before extinction * 100 years per life). Given these rough estimates, we can do some quick algebra to find the probability threshold that would make it worthwhile to spend money mitigating existential risk: 10¹⁶ / 10²³ = 0.0000001. 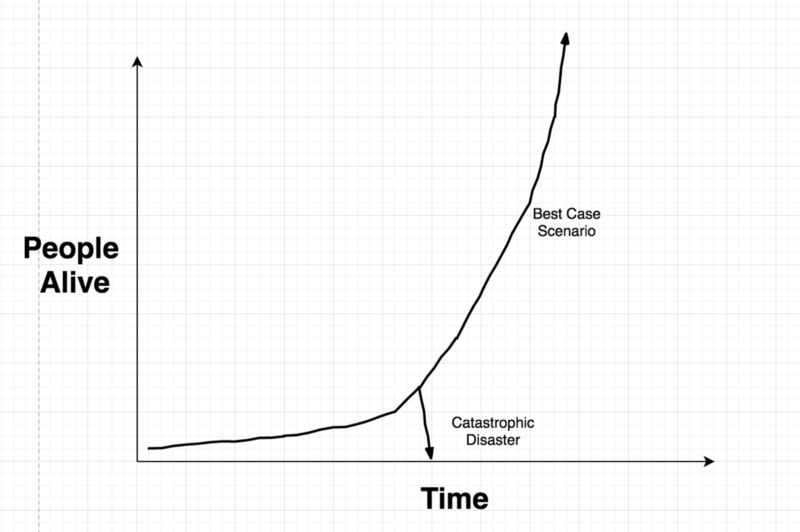 So if the chance of some catastrophic disaster is more than one in ten million, it’s more cost-effective to mitigate that risk than support the lives of people currently suffering. So how do the best-estimate numbers actually work out? The Oxford Future of Humanity Institute guessed there’s a 19% chance of extinction before 2100. This is a totally non-scientific analysis of the issue, but interesting nonetheless. The risks of non-anthropogenic (human caused) extinction events are a little easier to quantify—based on asteroid collision historical occurrences and observed near-misses, we can expect mass (not necessarily total) extinction causing collisions to happen once every ~50 million years. A compelling argument supporting a non-negligible chance of extinction is the Fermi Paradox. If intelligent life developed somewhere else in the galaxy, it would only take a few million years to travel across the entire galaxy and colonize each livable solar system. That’s not much time on cosmic and evolutionary scales, so where are the aliens? Either we’re the first life form to civilize, or all the others died out. Many astronomers studying this topic think the latter case is more likely and we have no reason to say we’re any different. 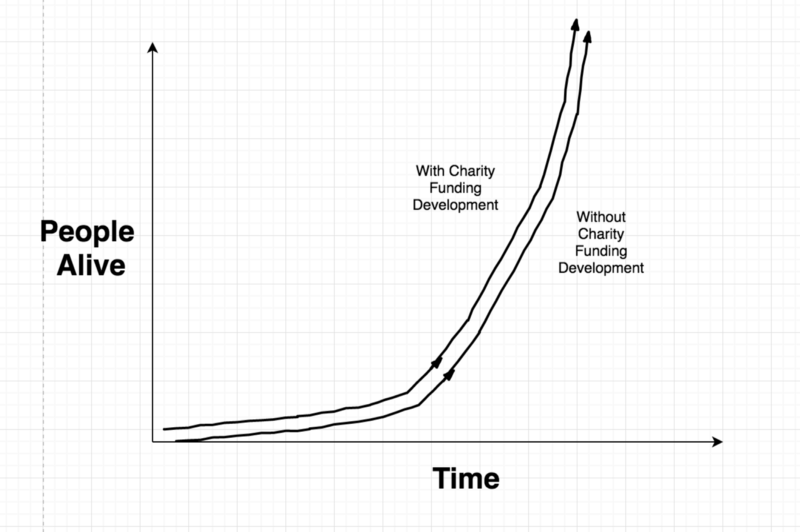 These pictures are good at explaining the magnitude of risk involved and the sentiment of those that argue for funding Existential Risk research over traditional charity. So how should you choose to effectively allocate your resources to do good? That’s still a tough question. I’d highly recommend reading The Most Good You Can Do. Most folk involved in the Effective Altruism movement (myself included) would suggest supporting GiveWell or The Centre for Effective Altruism. But if the idea explained in this essay is powerful enough, consider the Centre for the Study Of Existential Risk. Thoughts? Tweet me at @whrobbins or find my email at willrobbins.org! Performance based compensation for traders and portfolio managers is, in theory, a great way to align everyone’s incentives and reduce the overall system’s risk. But the problem with bonuses and incentive schemes is that they often look short-term and reduce downside risk to traders but leave the upside unlimited. Say you’re a trader who has a $100k base salary with an annual performance bonus that increases by some amount for every percentage point that the trader beats the market index. This is a common scheme and it generally works alright. The investment a huge success. You make $100k salary and a $2mm bonus. The company you work for makes $20mm+. The investment a huge failure. You still make $100k salary (still not bad!). The company you work for loses $20mm+. Say the asset you invest in will plummet in value with 0.9 probability and skyrocket with 0.1 probability. Then the expected value of making the trade is about $300k from your perspective, but about $-20mm from the company’s perspective. Clearly this is massively unbalanced and will incentivize risky behavior that could have rippling effects in the firm as well as the overall economy. Making investments through a smart contract or DAO token would enable companies and employees to pay out based on some arbitrary function of investment performance. Instead of just cashing out on an investment’s performance with an annual bonus, the value of a smart contract / DAO token could accurately, easily, and securely be pegged to the investor’s performance across an entire career. This could help solve problems 1 and 3 listed above. Traders could work knowing that a series of short-term risky plays would absolutely not be in their interest. Incentives of the firm and individual would be aligned much more effectively and this could help mitigate financial crises. Problem 2 is more tricky to address. One potential solution would to create a market of these bonus contracts/tokens. Users could look at a portfolio, assess it’s risk spread instead of value, and make bets on whether the bonus plan is likely to be stable. Of course this market would be effectively facilitated by a smart contract or DAO! I don’t know if this idea has been explored before by existing financial institutions—please let me know if you’re familiar with it! I think it’s way too early to begin building something similar to what I’ve described. There’s no way to effectively track the performance of generic assets over time because most trades take place on private/opaque platforms. This would become feasible if DAOs and blockchain marketplaces become far more common. Hopefully that’ll be the case and someone will pursue this concept—it’s important to think more about financial risk and stability as economies and (crypto)currencies become more globalized. As the owner of a mildly successful Android app, I sometimes get emailed about advertising, marketing, or acquisition opportunities. The messages usually propose some sketchy advertising partnership or pitch me some SEO work, and they’re pretty easy to weed out and ignore. I recently had an interesting encounter. It started off with another cold email. For context, I’m trying to cash out on my app by selling it. Interesting. Not too many red-flags popping up yet. I responded quickly. School’s about to start and if there’s opportunity for a deal, I want to get it done ASAP (so don’t judge my utter lack of negotiation!). Yes, I can accept that offer. What information would you like from me? I’m not sure what their desired endgame is. Steal the app by reversing payments? Get my acct. number for the wire, then print checks with it? I start doing more in depth research on this guy. Not much comes up when I scour the web for his personal information and business records. I manage to convince him to chat over Skype, and we talk about his background and what he plans to do with the app. I can’t get a single substantiative answer to my questions. As far as I can tell, everything he told me was a lie. Clearly this guy’s not legit. But at this point I’m too curious. What’s he up to? I’ve decided to not move forward with the deal. You said that your company has been around for 10 years [on the Skype call] when it’s only been around for about a month. I’m not sure what exactly is going on (swapping the app out for malware? ), but I can’t be a part of it. Could you enlighten me as well what is the real concern about? As the app purchase does not reveal any of your personal information and it is alright if you don’t wish to provide the original source code. This concerns me for two reasons. I’ve had 3 “online advertisers” with non-existent reputations contact me in the past couple of months looking to buy Brick Breaker Free. I never had a problem with that previously, so it looks like this strategy is catching on. This also implies that it’s profitable. Second, users can’t do anything to fight this scam. One day, you’re playing a fun game on your phone. The next day, you update to the latest version (I’m sure it’ll mention “bug fixes” or something similarly innocuous) and BAM! Malware. From the development side, I know how tempting it is to just sell an app without due diligence. It’s not hard to see through these people’s shenanigans, but what if someone doesn’t know what to look out for, or what if they just don’t care? What if the scammers become more sophisticated and well-versed in business etiquette? I just don’t see any way to easily prevent this from occurring. Last week I saw a post on Hacker News called “How to get your app noticed on Google Play.” If you’re interested in that type of stuff, go check it out. I started messing around with Android when I was 15. Writing a few one-feature apps (think soundboards and tip calculators) got me familiar enough with the platform to have a go at a market-ready product. 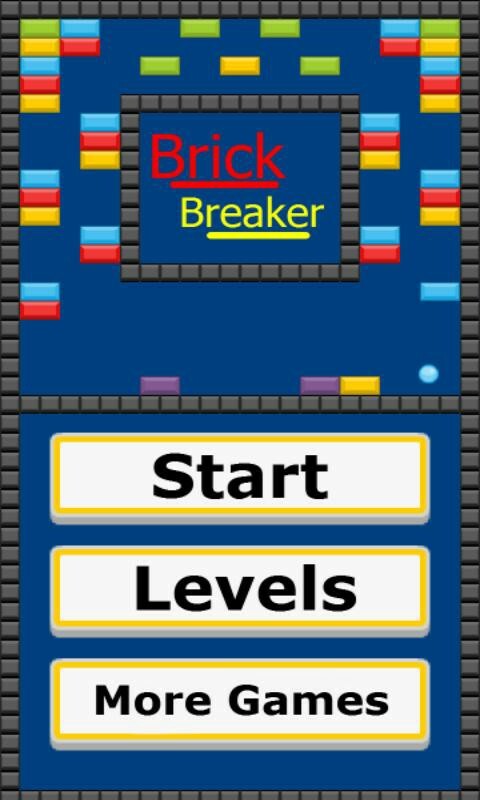 As a kid I loved playing Brick Breaker on my dad’s Blackberry, so I decided to build a clone called Brick Breaker Free (BBF). Let me take a moment to say that there are many, many different types of mobile applications. The marketing tactics that work for one app may be wholly ineffective or even harmful for others. I had known from the start that I wouldn’t make much money. Android developers get more downloads on average than iOS devs, but they earn about 1/5 as much money per download. Furthermore, being able to say “100k people have used my software” can provide returns far greater than the cash upside (think college admissions, scholarships, and job applications). I highly recommend keeping this in mind — often times, the number of downloads you can get is inversely related to how much you monetize your app. Lets think about the steps leading up to a user downloading an app. User looks at screenshots, perhaps looking at the description or reviews, and makes the decision to install. Your goal as a developer (in addition to building something you personally enjoy and learn from!) is to make each step in the process as frictionless as possible and to widen the sales funnel. One of my favorite things about Android is the size of the platform (hint: it’s huuuge!). If all three of the above steps are facilitated, you’ll be in a good place. As it turns out, a lot of people like Breakout style games. Although I wish I had the foresight and market understanding to intentionally choose such a lucrative genre, I just got lucky on this one. I wanted to recreate a childhood favorite and BBF was simple enough that I could actually build it given my amateur coding skills. What I would have done if I were a little more deliberate is gather key metrics on the idea’s genre/space. If you wanted to build, say, Uber for dog-sitters (update: it turns out this actually exists! ), make a list of keywords and search for the common permutations on Google Play. Then look at the top 20 apps, get an estimate of how many users they have (look for the range that Google gives). Select a search-term namespace that already has over a million users because it’s quite difficult (and often expensive) to organically generate demand/intent. Unless you’ve got unique insight into the direction that user demand is going, breaking into an existing market segment will be a lot easier. When I published BBF, only a few people happened to stumble upon my app each day. It’s hard to stand out when there’s 50 other games with a similar name and purpose. I tried the default tactics like posting to websites and sending links to friends. Nothing really caught on. Driving growth through posting online is time consuming and hard. Luckily, I had turned 16 and gotten my driver’s license a few months before publishing the app. I drove to Best Buy, the AT&T store, and anywhere else I could find android-powered smartphones. Then I installed my app on each available demo phone, bookmarked a link to the Play Store page, and rearranged the home screen to favorably display my app’s icon. Supposedly this caused random customers to see the app and install it themselves. Originally, BBF was nowhere to be found if one were to search with the words “brick,” “breaker,” “breakout,” or any similar phrase. After Google’s algorithm saw some growth and a sudden bump in it’s popularity, BBF consistently appeared in the top 12–36 results for relevant searches. Given the sheer volume of Google Play searches, that ranking did wonders for my discoverability. I can’t give a hard number on how many people viewed my app, but it got hundreds of thousands of eyes on the store listing. That got the snowball rolling. Unfortunately the trick that worked for me probably doesn’t work anymore. Last time I checked, retail stores got sick of people like me and restricted the demo settings/permissions, so you’ll just have to get creative when building a critical-mass user base. If you don’t mind sifting through the results of such a buzzword, try Googling “growth hacking” and think about the tactics that you may find to be effective. Once a user has stumbled across an app (meaning they completed the first two steps in the process I outlined earlier), they need to see enough potential value to hit the install button. I say “potential” because you don’t need to prove that you’re the perfect fit to the user’s needs — that’d be a pretty high bar to meet. It’s easy enough to test out an app and uninstall it when boredom hits, so you’ll just need to show that your app has some social proof and looks like it could be good. Then I gave special thought to photoshopping an app icon, as they are first impressions and the face of your application until a user clicks on the store listing. 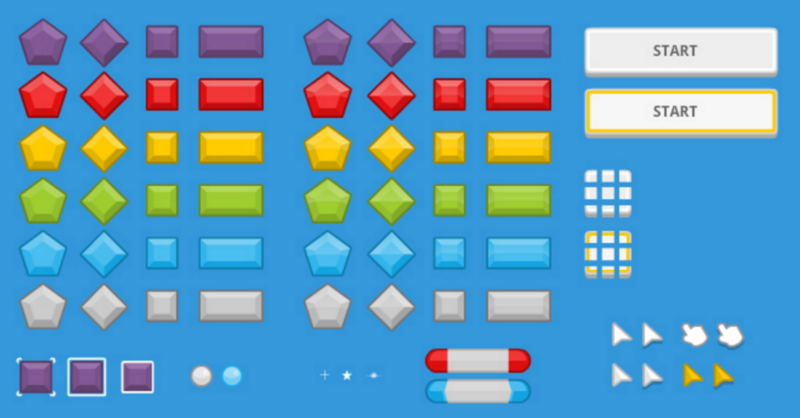 Take care to design a bright and simple icon — which one of the following apps stands out at first glance? This is the growth chart of my app over time. 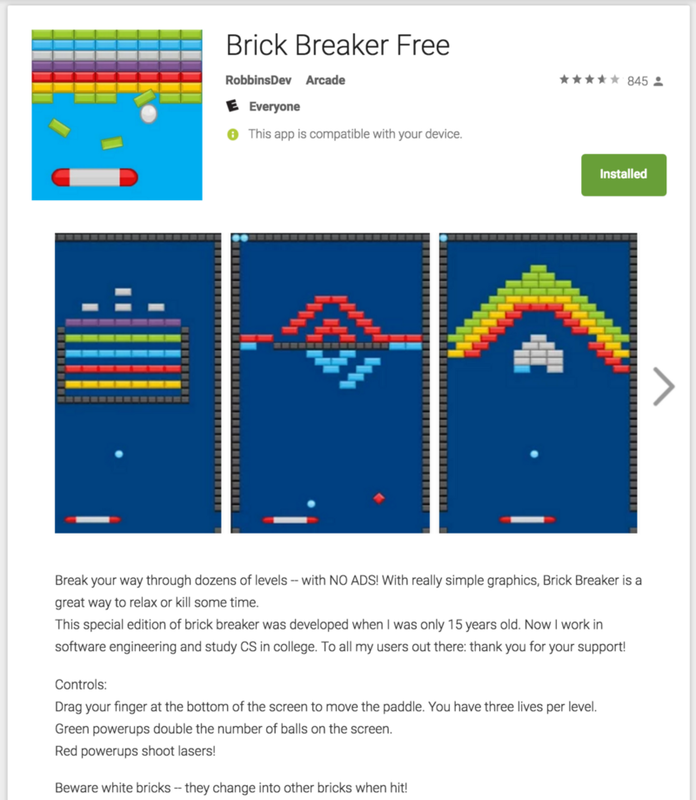 Clearly I’ve hit the ceiling set by my app’s engineering quality, design quality, Google Play reviews, and the number of people in the market for a Brick Breaker clone. Overall, I’m very happy with BBF’s performance. I do have one regret, however, and that is not diving deeper into analytics or A/B testing. 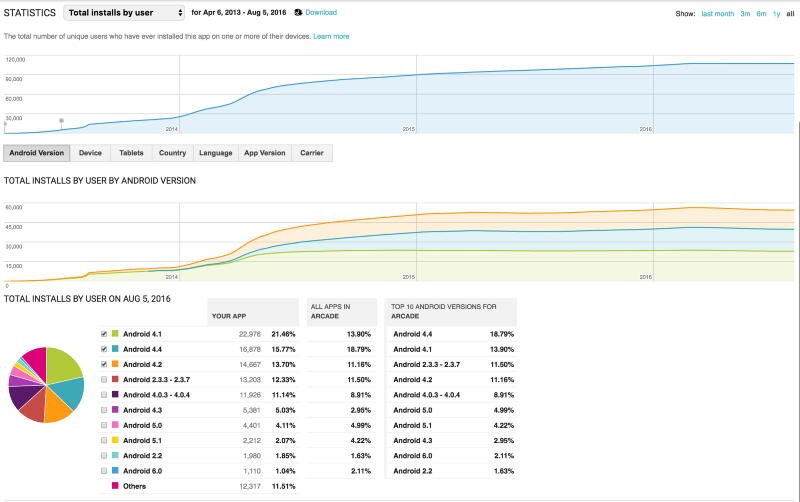 It wasn’t easy finding information on Android’s metrics (questions like “what does it mean if my users have older versions of Android installed?” were left unanswered) and I bet there’s a lot of valuable insight somewhere out there. If anyone reading this is aware of good resources on the topic, let me know! That’s all I’ve got for today. If you’ve read this far, follow my blog for more in the future! Towards the beginning of this post, I mentioned that I didn’t try or even want to make money with my app. Although that’s true for the most part, I did explore monetization options after the app had caught on. At the time, the mobile game dev community was having a vigorous discussion about the future of mobile app business models. Freemium, Tiered-Service, and DLC strategies were being fleshed out and tested on large-scale platforms by different companies. And it didn’t help that Zynga’s stock had crashed and was showing no signs of recovery. It seemed to me that AdBlock was successful with this model (which I later learned is called Donationware) so I figured I’d give it a try. The mobile game industry had to be so laser-focused on their bottom line that it could easily overlook such a strategy. After all, if anyone could pull off the Donationware scheme, it’d be the high school student who politely asks for money to spend on software and education. So what happened? The experiment successfully produced evidence relating to my hypothesis. And by that I mean it proved my ideas were completely wrong. Out of the tens of thousands of people who installed my app, I think I convinced 4 of them to donate a total of $5. Oh well, now we know without a doubt that people truly do prefer things to be free! Who could have guessed?